The average employee spends 37.3 hours at work per week,1 equating to more waking hours at work than those spent at home, therefore, developing office relationships is natural. How can romantic encounters at work be handled, are they really as counterproductive as most people think? The workplace is an environment where employees are always expected to carry a certain level of professionalism. However, it is not unheard of for relationships to develop in the office. Friendships also tend to blossom at work, as employees spend so much time together and colleagues are understanding towards the demands of the job. As an employer, consider having a policy towards relationships at work. Most companies have an unwritten policy towards relationships at work, which is usually picked up on quickly by new employees. In the Employee Handbook, it may be sensible to have a section permitting relationships at work and setting out the rules and expectations in relation to this, which may be an adequate step to take to avoid any serious issues. If two employees in the workplace are in a relationship together, they should continue to treat their job professionally and respectfully. Avoiding public displays of affection at work is a good way to avoid raised eyebrows or awkwardness amongst colleagues. Office environments are often a gossip-hub and rumours can spread like wildfire. This can be avoided through communication. If an employee begins a romantic encounter with a colleague, they may wish to tell their manager to avoid speculation. Whilst relationships at work can often be frowned upon because people suspect them to decrease concentration and productivity, they are likely to be harmless if they are managed correctly. The key people involved are the two employees pursuing a relationship and their managers, so it is important for their romance to be treated respectfully and morally. Keeping management informed of these encounters is important, as they can ensure there is no interference with work and no lines are crossed. Relationships in the workplace are very personal and should be treated carefully. 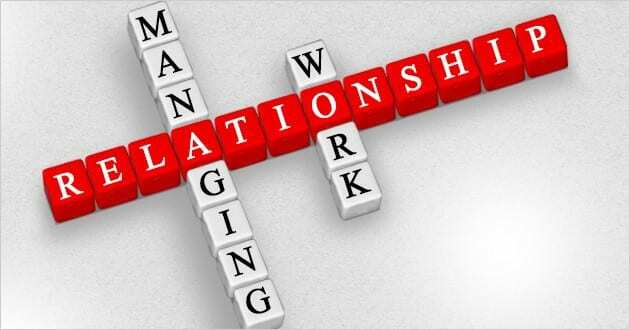 For further help on managing relationships in your office or place of work, please contact Clover HR today.